The earliest picture of the band we have taken within Gresley Colliery the then home of the band. Brass Bands have changed greatly through the years gone are the old fashioned uniforms and instruments supplied by the colliery. 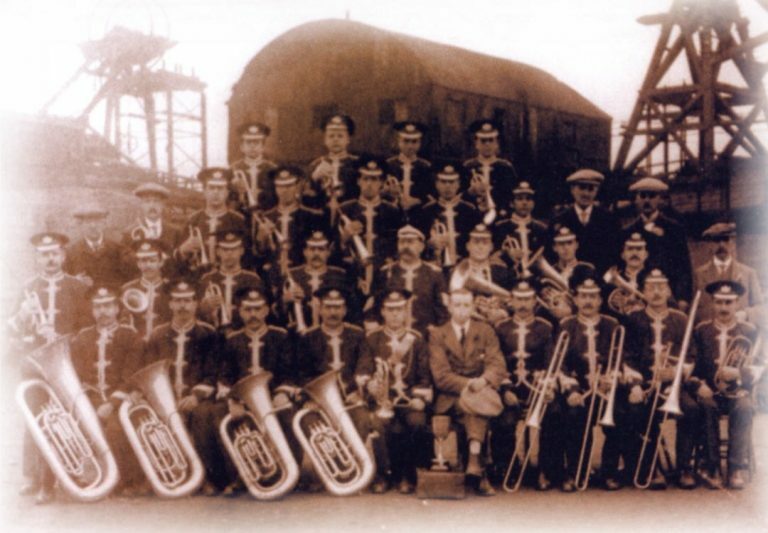 When this picture was taken at the colliery band members were even paid by the colliery to attend band. Today the band has to raise its own funds and provide its own instruments. Pictured here with their conductor Ken Keats at the Memorial Park in Church Gresley, the band had been asked to march for ‘Chairmans Day’ (Swadlincote not being big enough to have a mayor). The band march from Gresley Old Hall via the Memorial Park, where the photograph was taken to Gresley Church. The march took place in different districts each year depending upon where they came from. 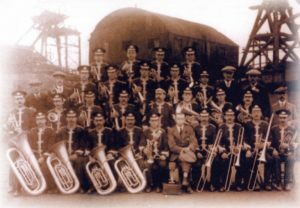 Gresley Colliery Band 1960 – Pictured here with a very proud young Nigel Boddice (the youngest member of our band at the time) we meet our then Band Chairman Ron Clay who spent an amazing 57 years playing with the band. He is pictured here just after the band had won the National Finals for the very first time. In 2006 at the AGM of that year it was decided to change the name back to its original Gresley Colliery Band which has remained to the present day. This was felt to be a suitable tribute to the band’s mining roots and was the inspiration for a CD in 2006 , Heritage. Since the 1970’s Gresley Colliery Band has enjoyed considerable competition success having been Regional Champions and National Finalists. Following a series of impressive 1st section results including a win in 2007 and 3rd place in 2009, the band was promoted to the Championship Section for 2010. This was the first time the band had competed at this level in its 150 year history and subsequent solid results against the very best bands in the Midlands region ensured continuation in the Championship Section for a further three years. Despite demotion back to 1st section in 2014, the bands drive for success still remained throughout 2014 and the band produced some good results. October 2014 saw the start of a reform of Gresley Colliery Band with a new committee and a clearer direction for the band. In March 2015 saw a brilliant 2nd place result leading them to the finals in Cheltenham in September of the same year and the band continues to build on their successes a year on with good performances at Butlins 2016 and the Area competition at Bedworth in March – The Band are now placed 2nd in the1st Section table… Will 2016/17 be the year the band enters the Championship section – this is certainly a band who could do this. Exciting times ahead! Keep visiting for more information about the bands history coming soon. If you are really interested you might be interested in our book, which we hope will becoming available later in the year – keep watching.